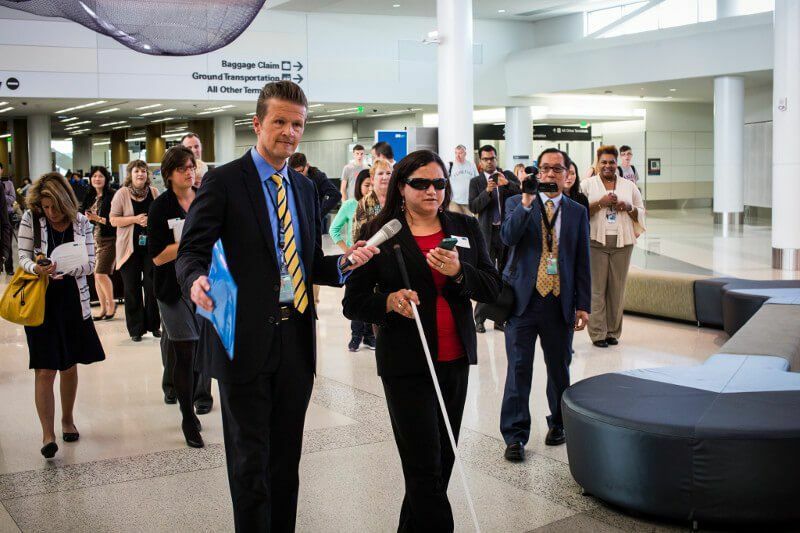 In cooperation with San Francisco International Airport, we unveiled a prototype smartphone application which can assist visually impaired passengers navigating through Terminal 2. The combination of indoo.rs® positioning algorithms, Bluetooth low-energy Beacons, Wi-Fi access points and a mobile app, helps guide the passengers. In addition, routing-by-voice is available through the use of the smartphone’s accessibility feature. The collaboration of indoo.rs and SFO was made possible by Mayor Ed Lee’s Entrepreneur-in-Residence Program. The prototype version will undergo additional testing and refinement before being released for use by the traveling public. In theory, the San Francisco Airport could also push discounts and retail information to travelers as they navigate towards their gate via Beacons. Lisa Martinez from LightHouse for the Blind and Visually Impaired is doing a demo at terminal 2 of San Francisco Airport.